Services to meet your hair cutting needs. Spa service incorporating shampoo, scalp and shoulders massage, hair cut, line up, facial grooming, and finish style. Refresh, balance and add shine to natural and colored hair. An ideal service for men to blend or cover up gray/white strands. Finger blow-dry and quick style. The beauty salon groom is a classic service to make you look and feel great. In the modern world of disposable razors and electric shavers, its easy to keep that beard or mustache trimmed. 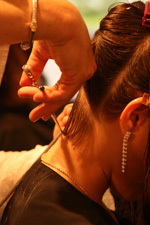 But a salon-style service will give you the most symmetrical and trim you have ever had. Our kid-friendly staff is specially trained to provide hair services for children ages 2 to 12. We understand that children may be fearful, impatient or squirmy but we will work with them with compassion and patience for a memorable and positive experience.